Grandeur nature | One quality, the finest. For the last several years I’ve gotten a page-a-day art calendar from The Metropolitan Museum of Art. It’s a pleasure to see familiar works of art and get a brief introduction to some new ones. A recent page featured a black-and-white photograph by French photographer Eugène Cuvelier, a new name for me. Cuvelier was born in Arras in the north of France in 1837. His father was an amateur painter and adept hobbyist photographer. He became close friends with the landscape painter Camille Corot who had a huge influence on his artistic development. Corot introduced him to fellow Barbizon painters Henri Rousseau and Jean-François Millet. 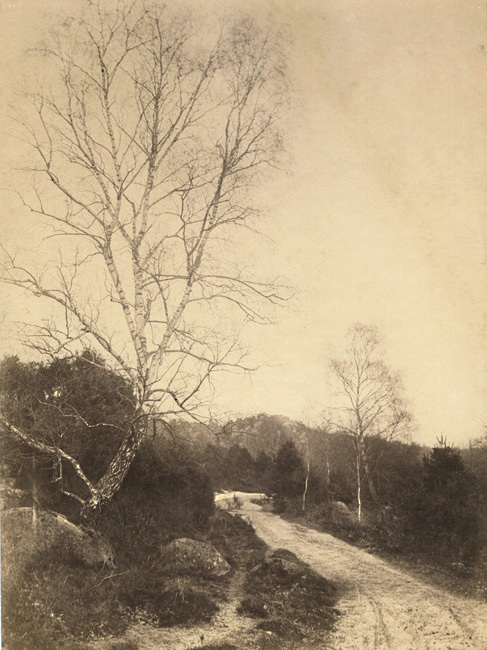 While they were painting in the forest of Fontainebleau, Cuvelier was composing photographs with a painterly esthetic. Today’s expression, grandeur nature (grahnduhr natoor) means life size. Cuvelier’s are just the size of a standard piece of paper, but he managed to convey the grandeur of the natural world. This entry was posted in Photography and tagged Camille Corot, Eugène Cuvelier, Eugène Cuvelier: Legend of the Forest, French photographer, grandeur nature, The Metropolitan Museum of Art. Bookmark the permalink.